Since debuting in 2006, Topps Allen & Ginter Baseball has offered some of the most unique and diverse cards in the hobby. Whether it's the classical designs, wild inserts, massive amounts of mini cards, the interactive Ginter Code, the expansive autograph checklists, this is one set where it could be said there really is something for everyone. It's exhausting just to look at the number of aspects the set has each year. Above all, it strives to be fun. 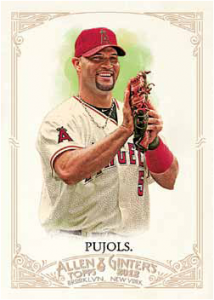 2012 Topps Allen & Ginter looks to follow a similar path. However, it also looks more loaded. Although the non-baseball content is still very much there, it isn't quite as dominant. Also noticeable is the autograph checklist that has lots of legends and timely signers from outside the world of baseball. We had a chance to interview Matt Perrone, a Brand Manager at Topps, via email to get a behind-the-scenes look at 2012 Topps Allen & Ginter Baseball. He was also able to share some of the details of what goes into planning the set each year. Cardboard Connection: What can collectors expect when they're busting boxes of 2012 Topps Allen & Ginter? Matt Perrone: In addition to a base and autograph set featuring scores of baseball stars and other champions, we've got some of the most innovative relic cards we’ve ever done in this year's set. The goal with Allen & Ginter is to give collectors the baseball cards they want, but also surprise them with every rip. If we can hit both of those with every pack, then I think we've succeeded. CC: The autograph checklist seems particularly loaded this year, both in the baseball players and the non-baseball subjects. Was there any extra focus on getting such big names? MP: We always try to put together the strongest autograph checklist possible. Of course, we’re somewhat at the mercy of the people we're trying to sign, so there’s always an element that’s out of our control. Our licensing department did a particularly great job this year, and I think you can see the results in the checklist. CC: The signers also have a very timely aspect with Erin Andrews making headlines by switching networks, Kate Upton getting the SI Swimsuit cover and Roger Federer winning another Wimbledon title. How much of an impact do you think this will have as far as collector reception? MP: We hope the things you mentioned get collectors even more excited to chase these cards. We try to provide a good mix of classic champions and those who are more currently relevant. Predicting the future can be tough, and sometimes things just click better than others. I think this year is one of those years. CC: What are you most excited for in the set? MP: Personally, for the last few years I’ve always been most excited for The Ginter Code. It's a chance to flex some different mental muscles than usual and engage those collectors who enjoy it in a very different way. We've taken a whole new path this year and I'm excited and curious to see how the aspiring code breakers take to it. CC: Are there any yet-unannounced surprises that collectors can look forward to? MP: Absolutely! But being what they are, they will remain unannounced. For now. CC: Will Bryce Harper be in the base set? If so, will he be a short print or variation? MP: Bryce Harper's rookie card is in the base set, un-short printed and un-gimmicked. And there's also that auto to chase. CC: Now that it's in its seventh year, how do you keep the brand fresh? MP: Well first, we do try to keep it fresh every year, and I’m glad to hear you think we've succeeded so far. We try to strike a balance between providing unexpected new additions while still giving collectors what they expect out of Allen & Ginter. A&G's got a bit more leeway than most other products, with all the non-baseball content. So we basically just brainstorm a bunch of stuff we’d like to see on a card, as well as go through all the timeliest happenings in the world to see if any of it makes sense for Ginter. In those initial meetings, no idea is too weird or out there. I think a big part of Allen & Ginter's appeal is the thrill of the unexpected, and we strive to continue to deliver that. CC: When does planning start for the next year's set? MP: I think you mean when did planning start for next year's set. Ginter's kind of a special beast in that way. It's always an ongoing process. 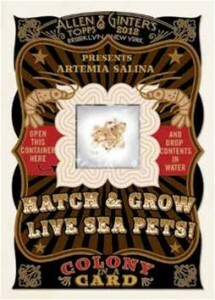 Ideas pop up all the time in all sorts of ways, and if we can get it into the upcoming Ginter, in it goes. If not, we file it away for the next year. But in the next few months, as we see collectors’ reception of this year's product, we'll switch gears from that informal process and begin planning 2013 in earnest. CC: I imagine it would be fun brainstorming some of the non-traditional/non-sport content. How is it different from planning other sets? MP: It is a lot of fun. And just as with collectors, everyone who works at Topps has great ideas for what they'd like to see in Ginter, from people in our sports department to human resources and even into our candy division. People send those ideas over or just mention them in the hallway all year long. It's a really open, collaborative process. So we're never at a loss for new ideas to work into the product. Of course, at a certain point we need to sit down and start making decisions, so that's when the Ginter team gets in a room and starts going through the suggestions we've accumulated, as well as brainstorms new stuff. As I said before, in the early stages no idea is too crazy, so those meetings can get a bit odd. CC: How are the non-sport "Champions" selected? MP: It's much the same process as the other stuff I mentioned. Everyone's got someone they'd love to see on a Ginter card, so we keep a running list of those people and basically pursue them all year long and get them into the product whenever we can. And anytime anything big happens, we try to jump on it as quickly as possible. One nice thing is now that we're in our seventh year, Ginter's pretty well known outside the trading card community, so it takes a lot less explaining when trying to do a deal, and we have some pretty big names coming to us looking to be in the product. And to give you an idea of how this is truly a year-round process, I'm excited to say that we just agreed to a deal with a pretty huge subject we've been pursuing for years. 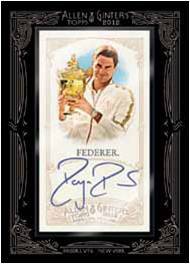 No names yet, but it’s already got me excited for 2013 Ginter! We'd once again like to thank Matt for his time.